Edgelets™ enable application developers to focus on solving their customers operational challenges, rather than on IoT technologies. Services can be rapidly created and deployed into production Smart Infrastructures™ within minutes. Through rapid integration of smart IoT devices, a new paradigm of real-time operational visibility can be instantly realized. Furthermore, Edgelets™ contextualize this data into actianable operational intelligence through visual dashboards using the ASE-V8TM analytics engine. 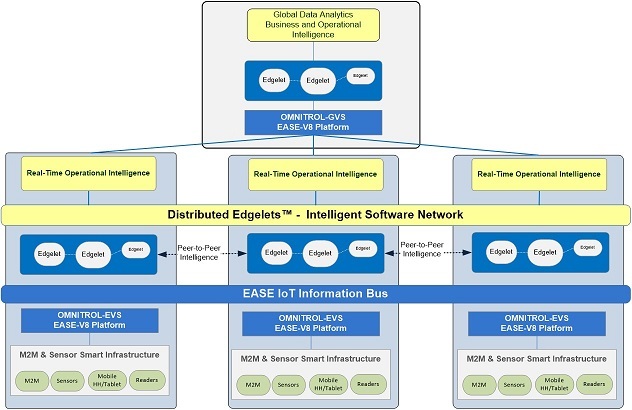 IoT data processed by EdgeletsTM can be easily integrated with existing WMS and/or ERP systems using a variety of avaialble open SOA interfaces.